Cinema in the Philippines might not be as vibrant as that of our Asian neighbors like Hongkong, South Korea, India and even Thailand but there are still pockets for celebration. I am glad Star Cinema is leading the way but it focuses on generic and safe topics for the purpose of revenue. It therefore stays away from sensitive issues and that limits the artistic potentials of our films and the people working in the sector. Good thing we have Independent Films (Indie Films) which serves as a bright spot for the industry. If not, there would me no movies like Maximo Oliveros, Masahista or Serbis right? Thus we should be thankful for the people and organizations championing the cause of Independent Film-making in the Philippines, one of which is CINEMALAYA. The Cinemalaya Philippine Independent Film Festival is a film competition and festival that aims to encourage the creation of new cinematic works by Filipino filmmakers – works that boldly articulate and freely interpret the Filipino experience with fresh insight and artistic integrity. It also aims to invigorate the Philippine filmmaking by developing a new breed of Filipino filmmakers. The Villa Los Reyes Magos, the decaying mansion of the Lopez-Aranzas, is the only remaining emblem of the once illustrious family of Gaspar and his sister Celia. When former congressman Gaspar slips into a coma, his opera doyenne sister Celia waits for a miracle through her grandson Antony, who she clads in Sto. Niño garb. But harsh reality in the figures of their children, Merced, Mombic, and Raquel, pushes the inevitable: the impending sale of the mansion to give way to a commercial venture. Celia wages her last battle to regain the glory of the past by hosting a splendid tertulla, her final eulogy to her own moribund class. Arthur Acuña, Fides Cuyugan-Asensio, Shamaine Centenera-Buencamino, Tony Mabesa , Raquel Villavicencio, Diana Malahay, Joaquin Pedro Valdes and introducing Jhiz Deocareza. Director-Loy Arcenas, Screenplay-Rody Vera, Story-Loy Arcenas & Rody Vera, Producer-Daniel Arcenas & Philippe O. Chambon, Director of Photography-Lee Briones-Meily and jay Abello, Line Producer-Krisma Fajardo,Assistant Director-Issa Lopez, 2nd Assistant Director-Ed Lacson Jr., Production Designer-Laida Lim,Production Managers-Philip Buena, Ron Capili, Editor-Danny Añonuevo, Sound-Mike Idioma, Music-Jerrold Tarog. Kiss”, Love! Valour! Compassion!”, “Chita Rivera: The Dancer’s Life”. He has also designed the sets for the off-Broadway and major American regional theater companies of the United States. He has collaborated with some of the most exciting American directors and playwrights including Joe Mantello, George C. Wolfe, Anne Bogart, Robert Falls, Terrence McNally, Craig Lucas, Paula Vogel. For his design work, he has received the Obie for Sustained Excellence of Scenic Design, the Bay Area Critics Circle Awards, the Jefferson Award, the L.A. Drama Critics Circle Award, the Michael Merritt Award for Design Collaboration. 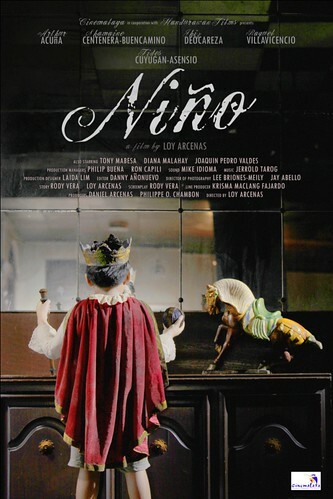 His directing work in the Philippines have included productions for Tanghalang Pilipino, including ‘ The Romance of Magno Rubio’; ‘Golden Child’ which received the Gawad Buhay awards for best direction, best production, best set design, and best emsemble work; and ‘Tatlong Mariya’ which has been nominated for 8 Gawad Buhay awards this year. wow.. ang dami na palang place para mapanood.. di katulad dati..
Parang ang cool nito ah. Hindi ko masyado pinapansin mga ganito dati eh.